If you’ve been wondering about the 3D Craze, and wanted to try something that was a little bit different than Monsters vs Aliens 3D, next weekend the Fairfax Corner 14 will be showing the Final Four and Championship games in 3D. 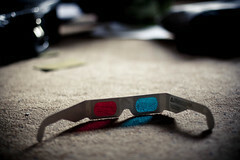 That’s right, Cinema-grade 3D to see Kansas win it all. Pardon me one second. No, I didn’t know that. Wait, what do you mean they lost? How is that possible? My bracket’s ashambles! Northern Iowa!?!? St. Mary’s?! Oh for crying out loud.